The What is Subud? website serves several purposes. First, it is designed to meet the needs of those who are curious about Subud and would like to learn more. Then, there are those who are perhaps thinking of joining Subud and would like more information. Finally, there are those who would like to "check Subud's credentials". The site may seem to be complex not only because it endeavours to meet the needs of different kinds of enquirers, but also because Subud itself is a rich and various activity. Subud is not only a spiritual movement, but also an international organisation which promotes activities in many fields of human endeavour including enterprise, social welfare and culture. The What is Subud section provides basic information about the nature of Subud including the meaning of its name, its history, its founder and the spiritual experience it offers. The Organisation section outlines the extensive international structure of Subud. Basic information will be found here for those who wish to "check out Subud" - such as the constitution of the World Subud Association and recent financial accounts. The Experience section provides some first-hand accounts by Subud members of what it is like to be in Subud. It includes a section of brief statements by members from various countries on "what Subud means to me". The Photo Gallery and Video Clips pages are self-explanatory, providing some visual documentation of Subud. The Contacts page will be useful for those wanting to join Subud or contact the organisation for any other reason. The Publications page tells you about the many books which have been written about Subud, and how to obtain them by accessing the Subud Publications International website. The Links page is a "portal" or window to a wealth of other information about Subud available on the internet. Whole sites will be found amplifying the various topics found on this site. 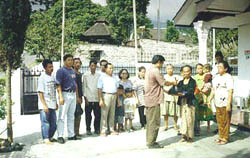 For example, there is a rich site about Susila Dharma, the social welfare aspect of Subud. A similarly rich site represents SICA, Subud's cultural activities. Please note that some aspects of some sites are only available to Subud members. The music heard on the opening page is Bapak Muhammad Subuh playing the Gambang, an Indonesian bamboo xylophone-type instrument.